An arson attack over the summer holidays caused serious damage to a girls' independent school in Manchester, but despite the loss of classrooms, computers and books, staff and pupils are determined to carry on as best they can with school life. In the early hours of Friday 22 August, intruders got into the grounds of Withington Girls' School in Fallowfield, Manchester. They climbed up onto the roof and spilt petrol which quickly caught light. 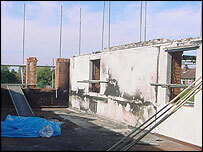 The fire took hold and seven fire crews had to spend nearly four hours bringing it under control. 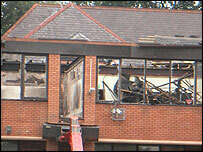 Three classrooms and a computer room were gutted and the school library and sixth form resource centre were seriously damaged. 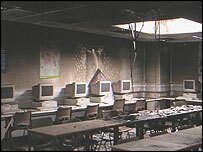 In all 56 computers were lost, along with printers, scanners, software, digital cameras, a photocopier and about 150 library books. Just a few hours before, staff and pupils had been celebrating the school's best GCSE results to date, with more than 94% of entries getting a grade A* or A. But at 1.30am, the head mistress, Janet Pickering, was woken by a call from the school's premises manager, Clive Stevenson, telling her about the fire. "There were times when we thought the whole school was going to go," said Mrs Pickering. 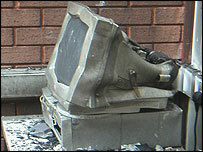 Mr Stevenson said: "I was very upset - I'd never seen a fire like that before. This is like home and to stand there and watch was awful - you feel so helpless." 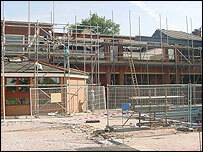 It will cost about £1m to repair the damage and it will be a good six months before school life is back to normal. Head girl Georgia Ellis says this spoils her final year at Withington. "It was just awful, I was quite angry really. It's our last year and there won't be much of a chance to see school back to normal which is a shame." Water damage to the school kitchen means hot meals are off the agenda and the cooks are working extra hours to prepare 3,500 packed lunches a week. "It's okay, but it's going to get a bit monotonous eating sandwiches for lunch every day," said Georgia. With the pupils' dining hall out-of-bounds due to water damage and an unsafe roof, the girls have to eat their lunches in their form rooms. "Lunchtime is havoc now - we've had to get the hoover out to tidy up," said Georgia. And the extra packed lunches means more rubbish. "We've had to increase the number of rubbish bin collections from twice a week to three or four times," said domestic services manager Sheena Cartledge. 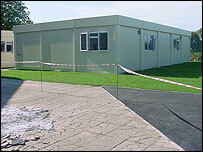 The work of the cleaners is further complicated by the addition of four mobile classrooms at the back of the school. "Although we've lost classrooms, we've gained them too and they're more difficult to access and more difficult to clean," said Mrs Cartledge. The mobile classrooms do not just get the cleaners down. Thirteen-year-old Elizabeth Antrobus, whose form room was one of the classrooms lost in the fire, feels isolated from the rest of the school in her temporary base. "We're on our own all the time - not many people come to see us because we're so far away," said Elizabeth. "And there's no space on the walls to put anything up. It could be cold in the winter and when it's raining it's really horrible going out there. "And there are codes on the doors and if you forget them you get locked out." With one of the main corridors connecting the two wings of the school closed off, 12-year-old Sangeeta Patel gets fed up with having to take the long way round to lessons. "It's really annoying because we have to go all the way round - down stairs, along another corridor and upstairs again. I feel more tired at the end of the day." The 630 girls at Withington are currently without access to the library's stock of 1,400 books and sixth formers have lost their study area for free periods. 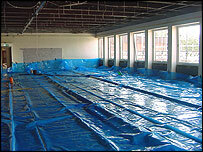 While only 10% of the library's books were destroyed during the fire, all the rest have been sent away for specialist treatment because of water damage. Librarian Alison Wells has contacted neighbouring schools asking them to lend the school core reference and text books. "Even when we get the books back from being treated, we're going to have to store them somewhere for six months because we've got nowhere to put them while the library is being rebuilt." Despite the everyday inconveniences, staff and pupils are upbeat about the challenges they face. The start of the new term was only put back by two days and a war-like mentality pervades the school. 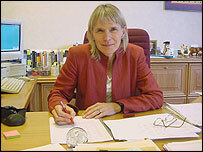 "We've had to turn this situation into a positive one," said Mrs Pickering. "It's a case of how soon can we rebuild and how can we turn this devastation into an opportunity so that the facilities are better than before. "Everyone is working together to minimise the impact." Deputy head girl Kate Antrobus said any naive feelings of excitement about a fire at the school were soon replaced by a sense of pride and protectiveness. "I just couldn't get my head around who would do this to the school," said Kate. "Every girl and boy dreams that it would be great if their school got burnt down, but in the event, no-one felt like that."